Top 10 Reasons to Join! 4. To establish and operate craft shows and to cooperate with other organizations to do the same. 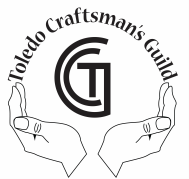 The Toledo Craftsman's Guild was started in 1972 with a nucleus of 13 people. Our first show was at Crosby Park in connection with their May Flower Show Sale. There were 22 participants. Our first Christmas Show was at a now non-existent hall on Sylvania Avenue near Talmadge Road. There were 44 craftspeople in it. The Guild grew steadily, and shows were put on all over town at Wildwood, Promenade Park, Gladieux, Adrian, Franklin Park Mall, Southwyck Mall, Lucas County Recreation Center, and Lourdes College. The Guild was incorporated in 1975 with a formal constitution and by-laws. Policies were added as various situations called for a rule to address the problem. Jurying started at this time in order to keep up the quality of our crafts. Our numbers rose to 350 Members which was our cut-off so everyone could be served at a show. Joan Shea and the original 13 members founded this organization. Joan and Judy Schaarschmidt are the only two original members remaining in the Guild. Toledo received the group with great appreciation.